Monster HTFS 1000 Power Center - Experience the Quality!!! Your high-definition flat-panel display represents a significant investment. Monster Power's High Definition Video HTFS 1000 PowerCenter protects your plasma or LCD display from harmful spikes and surges, while conditioning the power coming into your gear for optimal performance. Protect your investment and get all the performance you paid for with improved dynamic range and smoother, richer tones!!!! Your flat-panel's first line of defense, the HTFS 1000 has a whopping 3145 joules of Metal Oxide Varistor (MOV) protection. It uses Monster's Tri-Mode Plus protection circuitry that, when hit by a large surge, immediately disconnects everything attached to it to prevent serious damage. 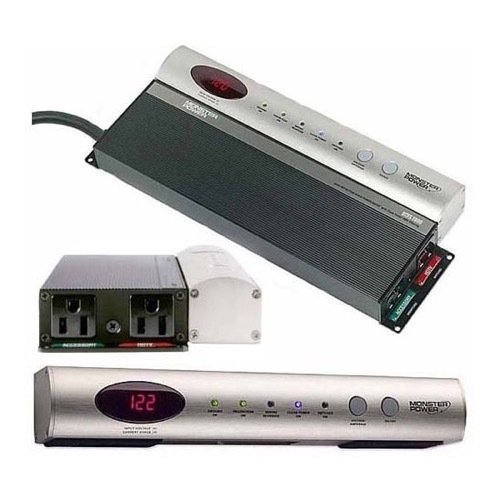 Advanced Monster HDV Clean Power circuitry with isolated audio and High Definition Video Filtering - helps eliminate electromagnetic and radio frequency interference from your AC power and components for better high definition picture. Detachable Diagnostic Control Panel mounts anywhere, under plasma or in your A/V component rack. Digital voltage/current draw meter and diagnostic indicators let you instantly monitor system performance. Exclusive Tri-Mode Plus circuitry to protect against potentially damaging surges and spikes with an audible alarm and auto disconnect: 3145 joules for ultimate protection. Compact, wall-mountable design fits behind flat-panel displays. 2 AC outlets with surge protection. 8-foot Power Line 200 power cord with 24k gold-plated contacts.